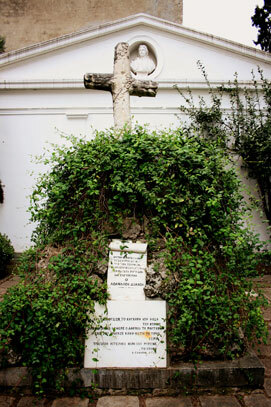 In 1886 after Major Rouvali's suggestion and later on with actions carried on in 1889 by the Mayor of Lamia named Sklivanitionis, the cenotaph dedicated to the tragic sacrifice of Athanasios Diakos has been built. He was one of the most exciting figures of the national rebellion of the Greeks. 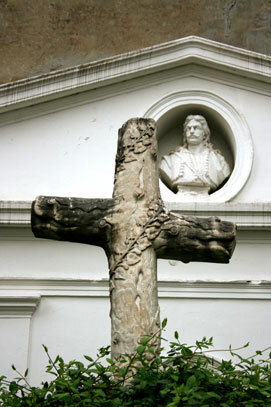 It is a Calvary, that means accumulation of huge rocks that bear a marble Cross on the top which is surrounded by bay leaves. On the facade of the Calvary the inscription says: 'Here is the place where on 23, April 1821 Athanasios Diakos died by impalement for the sake of Faith and freedom by the Turks '. 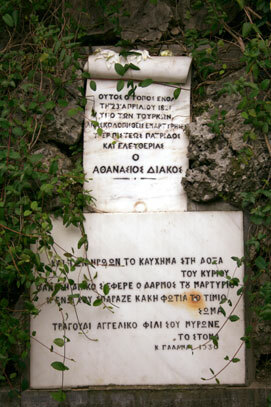 On another plaque that was placed in 1930 when 100 years from the Liberation of Lamia passed, the poet Kostis Palamas wrote the following verses : 'The road of sacrifice has brought you , Athanasios Diakos, on the heroes pride and the Lord's glory, while evil fire your honest body ate, an angel's kiss anointed your mouth'. 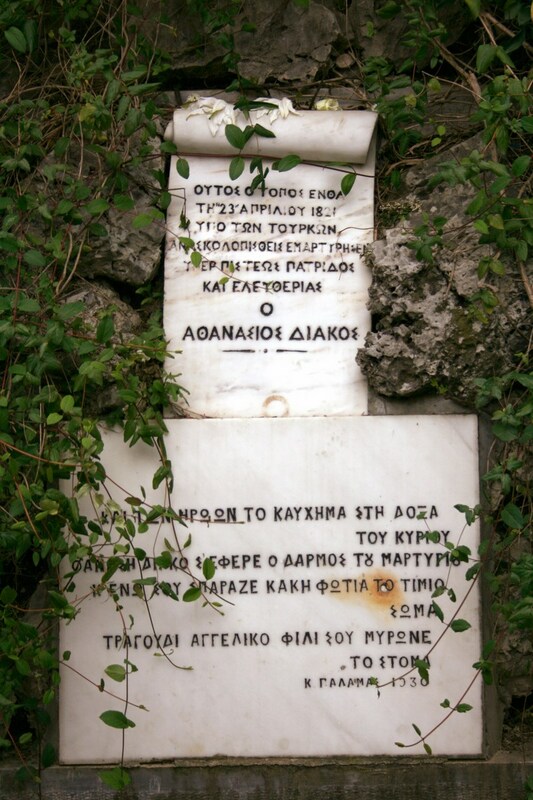 Athanasios Diakos was opted to fight for the Bridge in Alamana, thus on 22nd April 1821 along with 48 men we have a desperate battle. Nevertheless the revolution in Roumeli has already broken out and the city of Livadeia which was free, was risen the Greek flag at its castle on the 4th April 1821. His choice encouraged the rest of the Greeks in their fight for national freedom from the Turks and gave time to the up risen Greeks of Tripolitsa, putting an obstacle on the reinforcement of the Turks of the Peloponese, with additional military forces. Against the up risen of Roumeli have come Omer Vrionis and Kiose Mehmet in charge of 8000 soldiers and 900 Turk equestrians under the command to stop the revolution in Roumeli and them move to the Peloponese and eliminate the revolution in Tripolitsa. Although Diakos fought heroically to the end, he fell in the hands of the Turks since such fights were predetermined as was mentioned before. The Turks promised to honour and give him privileges if he denied the revolution and fought in favour of the Turks. 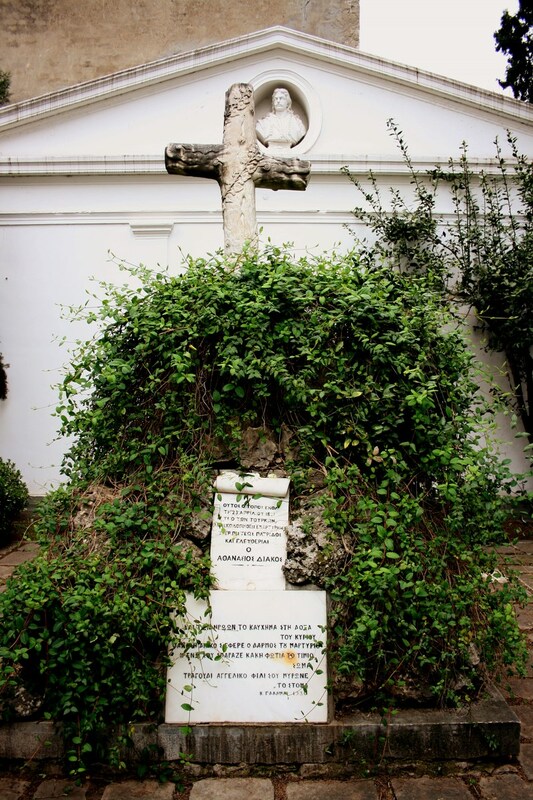 Diakos refused replying with the historical phrase : 'I was born Greek and I shall die Greek' , so the Turks gave him an agonizing death, impaling him to death. The Cenotaph is located in the pedestrian area of 'Kaliva-Bakogianni' directed from Parkou Square to Laou Square, on the right hand side. 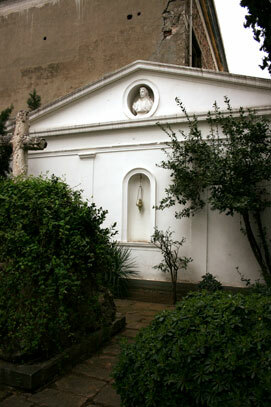 The church of Saint Nikolaos, the old cathedral of Ypati, dates back to the 18-19th century.